I needed a little inspiration: too many cloudy days here this winter in Poland...what else should I expect? Luckily relief was not too far behind. In early February I found myself on a trip to Warsaw with my wife to explore the city and its culture, including a visit to the new Copernicus Science Center, and most importantly to their Heavens of Copernicus Planetarium. < It was my first visit to one of the newer style of planetariums that utilize a number of digital projectors (no large Zeiss or Spitz dumbbell projector here), as well as a "tilted" dome that makes it easier to see the whole dome without straining one's neck. The show was "Space Journey": a trip in the not so distant future from Earth to Saturn, along the way discussing the mechanics of getting there. We as the audience provided input during the show on what items we would bring on our trip, which would have to bear later in the show as we had to use these items to try and deflect a comet passing by Saturn from its trajectory towards an imminent collision with Earth. All in all an enjoyable show, and the one thing most obvious during the presentation was that the youngsters (mostly 8 - 14 years of age) were the most engaged during the interactive portions of the show, frequently answering questions ahead of the adults! Good to see them get excited about astronomy and space travel. 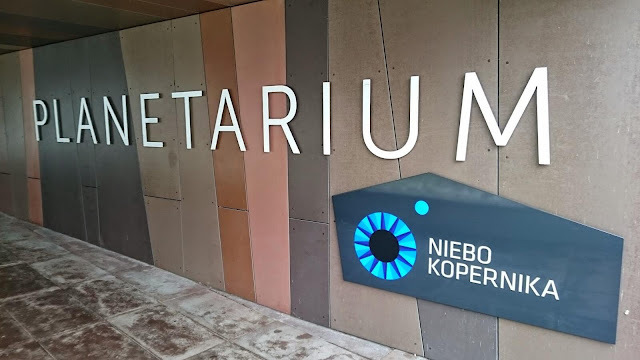 Finally, it was nice to see a familiar sight on the planetarium schedule: the ubiquitous Pink Floyd "Dark Side of the Moon" laser light show can also be enjoyed at the Heavens of Copernicus Planetarium. 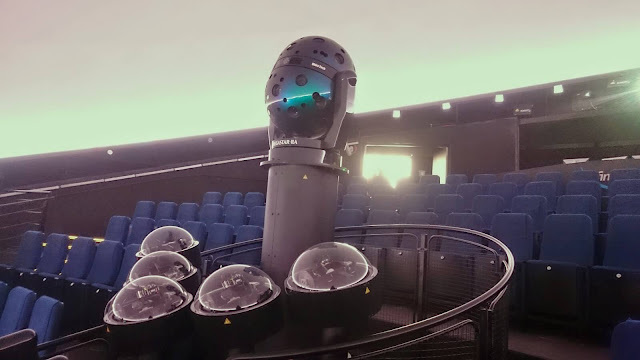 The last "Dark Side of the Moon" show I experienced was at the Flandrau Planetarium in Tucson Arizona over 20 years ago, so it's about time to see it again. Top of the to-do list for our next trip to Warsaw!